Moon Textile is one of the famous and leading fashion brand in Pakistan. Moon Textile is a fashion textile mill who has been working since very past years ago. Moon Textile has launched so many collection and gained a good response. 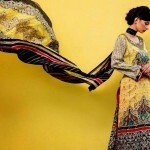 Moon Textile offers seasonal collection into two categories such as Batik Lawn and Barkha Lawn. Recently, Moon textile has released their Barkha lawn prints 2014 by Moon Textile. This beautiful collection has consists of lawn dresses with addition of chiffon fabrics. Each and every dress has embellished with lawn prints with full of elegant looks and styles. These lawn dresses are perfect for casual wear because of their designs and looks. Moon Textile has adorned these dresses with full of elegant looks and styles. The stitching styles are simple but stylish. The colors used for these Barkha lawn prints 2014 by Moon Textiles are bright to vibrant both. The red, green, blue, black, white and so many more are seeing in this collection. Girls!! just wait a bit here and have a look at them here below.